Get the job done quickly and comfortably with these bestseller disposable Cardinal gloves. This five star product is affordable and offers great quality and fit that is sure to keep you coming back for more. Whether you work in a facility or care for a loved one from the comfort of your home, these Cardinal Health InstaGard® gloves are perfectly suited for your everyday needs. Stay clean and protected in nursing homes, day care centers and assisted living facilities, as well as in the kitchen, the office, or when doing automotive or cosmetic work. You can also use these disposable gloves to keep your hands clean and dry while taking care of daily chores such as diaper changes, light household cleaning, food prep and cooking, personal care, painting, crafts projects, first aid, pet care and more. You’re sure to love these sheer, frosty white synthetic exam gloves, which are comfortable and sweat-free. These ambidextrous gloves have a smooth finish and are chlorinated and equipped with a convenient beaded cuff to make it possible to quickly and easily slip them on and off. The InstaGard® Exam Gloves are medical grade gloves, so they offer extra protection when coming in contact with blood or bodily fluids. 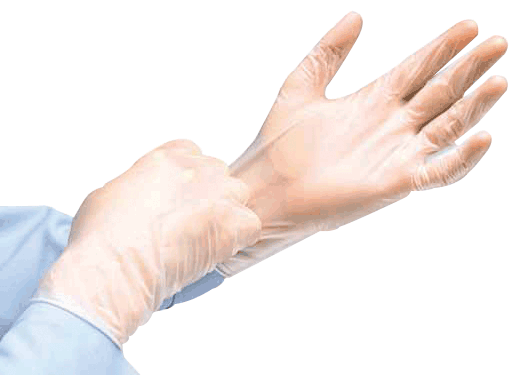 Medical gloves are ideal for use during patient examinations and blood tests as well as for managing incontinence. These medical gloves are powder-free to keep your hands and clothes cleaner with no powder residue, as well as latex-free for all-around protection for people with sensitive skin. Another great feature these gloves offer is the absence of the chemical smell some gloves have, so they're more pleasant to use. Synthetic gloves are made from PVC, or polyvinyl chloride, and are the most cost-efficient and comfortable of all glove options. Vinyl gloves also offer excellent chemical protection to keep you safe while you go about your daily tasks. These gloves are available in a wide range of sizes, from small to extra large. Get them in boxes of 100 or buy in bulk with a case of ten boxes so you never run out. For the best gloves at the best price, try Cardinal Health InstaGard® Vinyl Exam Gloves – you’ll be glad you did! Need it fast? Order today and get them tomorrow with our automatic 1-Day Shipping guarantee! Note: This product replaces the Invacare Supply Group and the Reliamed gloves item numbers ISG421VF1, ZGPFVSM, ISG421VF2, ISG421VF3, ISG421VF4, ZGPFVMD, ZGPFVLG and ZGPFVXL.